Anterolisthesis is a common problem in the spine of human body. This is a typical spine problem and occurs when the vertebral comes forward from the vertebrae. The condition of the problem defines the disease and it is also named after the same thing. If you want to understand the Anterolisthesis, then you must understand the vertebrae first and the anatomy of the spine. Vertebrae are the bones that create the opening for a Spinal Cord. The vertebrae are comprised of bones known as vertebra and drum shaped bones that are called vertebral body. Now the two halves of the vertebral body are connected through a disc. This is the normal structure of the vertebrae in the body. However, in Anterolisthesis the upper vertebral body tends to slip forward and lies abnormally as compared to the second vertebral body. This phenomena of slipping forward of the upper vertebral body is known as the Anterolisthesis. It causes immense pain at the back. The criticality and the damage amount of Anterolisthesis are measured with separate grades in the human body. The grades are defined as per the slipping amount mostly in percentages. Here are the different grades and the slipping percentage of the vertebral body in the vertebrae. Doctors say that the problem becomes chronic with the increase of the grade in Anterolisthesis. Basically, the higher is the grade, serious is the problem. Grade I: It is treated as the low intensity Anterolisthesis in the human body. The slipping forward percentage of the body remains preciously less than 25%. Grade II: The slippage percentage of the vertebral body in this situation remains between 25%-50%. This grade can be termed as serious in Anterolisthesis. Grade III: The percentage of slippage stays in between 50%-75% for Grade III Anterolisthesis. 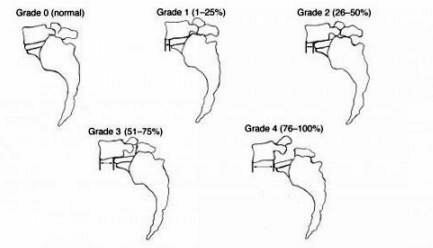 Grade IV: It is the most severe problem in Anterolisthesis as the slippage percentage becomes more than 75%. The Anterolisthesis does not trigger by itself and it is actually forced by some external reason. There are many reasons for the problem with the spinal cord. The most prominent and common cause of it is the accident or injury. If a person falls from height and injures his spinal cord then Anterolisthesis may lead to the situation. However, any accident that has a large impact on the Spinal Cord and adjoining areas can cause Anterolisthesis. However, it is not only the accidents that can cause the Anterolisthesis. There are other reasons too. The weakness of bones can also cause the same issue, especially at the later stage. On the other hand, bad postures during sleeping and sports activity may also cause the forward slippage of the vertebral body. 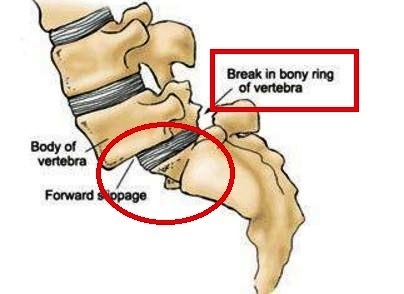 It is to be understood that after the slippage of the vertebral body the segment goes for mechanical breakdown. This is why the treatment of Anterolisthesis is very important at very early stage. It is a critical and painful problem in the body and hence need fast medical action. It is therefore very much required to understand and follow the symptoms of the Anterolisthesis. The symptoms of the problem, however, depend on and vary from person to person on the basis of the severity of the problem. The higher is the grade the complicated and severe will be the symptoms. The affected or the slipped area of the vertebrae experience severe pain. The amount depends on the grade of Anterolisthesis. It may be a localized pain, but it can also be wide spread. The pain tends to increase with time leads to vicious form. The muscular spasm tightens itself to protect the body and create more pain near the area. The pain becomes unbearable at one stage. The nerves of the body start suffering for the pain. Due to the pain in the nerve roots, the weakness and numbness can be experienced. Many patients complain about weakness and pain in both legs. Many instances are seen when the patients fail to control the legs. Tingling is another very common symptom of the Anterolisthesis. There will sensations inside the body that are not at all normal. It could be any feeling that no one has felt before in life. It however varies from person to person. The bowel movements and urine passing also become uncontrollable for the patients. This is probably the most important part of the Anterolisthesis. The treatments depend on the grade and condition of the displacement of the patient. Doctors may carry out X-Ray, MRI or CT Scan to confirm the Anterolisthesis. The first and the most common treatment of Anterolisthesis is Physiotherapy. The patient is basically put to bed rest for several months so that no further slippage occurs in the vertebrae. The physiotherapy is aimed to provide the pain relief and natural shift of the vertebral body to come to the original place. This might take some time, but it is effective. However, the patient might need to take rest for long time so as to fully recover. The Surgery is probably the last option that a doctor has for the Anterolisthesis. It is not a common and easy surgery to operate. It needs special technique as the vertebrae are placed inside the back and it is a very sensitive area. The surgery is mainly done through the mid layers of the ligaments and slowly reaches the vertebrae. The disc of the vertebral bodies is removed so as to align it again in the same fashion. The two vertebral bodies are fused by other bone taken from other parts of the body. There are artificial bones as well which can be fitted into it. There is Bone Cage also available with natural bone pieces and holes which help to fuse the vertebral bodies together.